Help Center is useless as it only contains instructions on memorializing it. There are a number of blogs going back several years of persons who are victims of this particular kind of abuse. 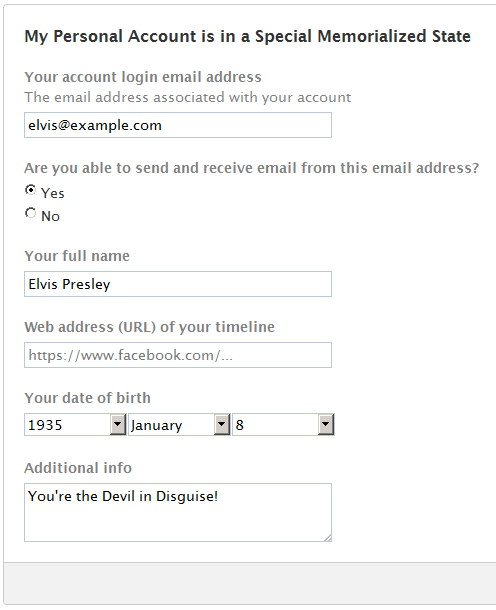 Apparently, you need my date of birth (which friends or friends with hacked accounts have access to) and a fake obituary (because no one at Facebook really reads them apparently). The best part is that you can't actually contact them in any expedited way to protest. In fact, I sent an email to get a bunch of useless links that I'd already looked at. Can anyone that has fallen into this entertaining conundrum offer some advice? There is a special Facebook page for that: My Personal Account is in a Special Memorialized State. You can fill out a form, and it will be reviewed. Well, whoever lied about you being dead did so under the penalty of perjury. 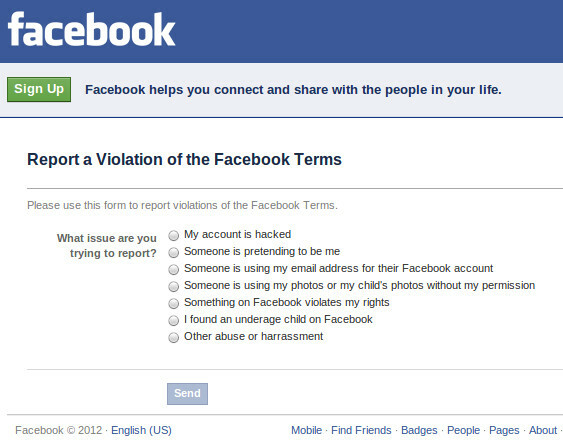 That said, the best course of action is probably to Report a Violation of the Facebook Terms. You probably want to choose either, "Other abuse or harrassment," and fill out the detailed form that brings up. Not the answer you're looking for? Browse other questions tagged facebook profile or ask your own question. How do I stop profile photo shrinking when moving a picture from an album to my profile picture? Can my deactivated Facebook friend still see my profile if I can see him on Messenger? Can someone hack my Facebook profile after I schedule it to delete permanently?